In a difficult footnote to the Reagan Centennial celebration, questions persist about Ronald Reagan's mental status during his White House days. When did the Alzheimer's disease start? The debate has provoked the latest Reagan family feud. In his new book "My Father at 100," Ron Reagan contends his father showed signs of Alzheimer's Disease three years into his first term. He said he noticed it in the president's performance in the Oct.7, 1984, campaign debate with Democratic challenger Walter Mondale. He writes, "My heart sank as he floundered his way through his responses, fumbling with his notes, uncharacteristically lost for words. He looked tired and bewildered." "Knowing what we know now, about the nature of Alzheimer's disease, we know that, decades before symptoms begin arriving, changes are happening in the brain," Ron Reagan adds. The late president's eldest son, Michael Reagan, had an angry reaction to Ron's assertions. In a Twitter post, Michael fired back: "Ron, my brother was an embarrassment to his father when he was alive and today he became an embarrassment to his mother." Early Show co-anchor Erica Hill asked, "Could it be possible there may have been something else? Could he have had dementia?" "No, he didn't have dementia," Reagan proclaimed. Presidential scholar Douglas Brinkley has a unique perspective from his analysis of President Reagan's writings. Brinkley told CBS Radio News that as editor of "The Reagan Diaries," he "saw no sign of Alzheimer's." Noting he is not a physician, Brinkley said he found that Reagan's writings "never changed in format or tone" during eight years of daily journal inscriptions. Brinkley found just one Reagan reflection on mental alertness. Toward the end of is second term, the president noted he was unable to identify a once-familiar canyon as he flew over Southern California. 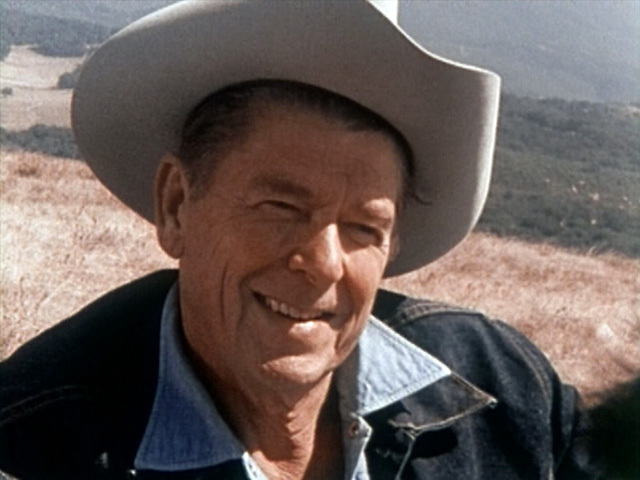 Brinkley said Reagan "recognized his mind was not as sharp as it once was" but he did ultimately remember Topanga Canyon. Brinkley chalks it up to "senioritis" and concludes, "I'm under the impression he did not have any signs of Alzheimer's as president. Until somebody puts up definitive medical evidence, we have to go with that." Over the years, White House reporters often wondered about Reagan's alertness, especially toward the end of his second term. At times, he paused and appeared to look into the distance as he formulated answers to questions or responded to situations. Journalists were unsure whether it was part of his hearing impairment or something else. When asked a question that he could not or would not answer, Reagan would sometimes say, "they [his staff] haven't told me what I'm doing yet." At a photo-op, reporters asked about the perceived the lack of progress on arms control talks with the Soviet Union. As the president pondered the query, Nancy Reagan whispered, "Doing the best we can." Taking the cue, Ronald Reagan repeated, "We're doing the best we can." Reagan also once mistook his housing secretary Samuel R. Pierce Jr. for a city mayor. "Hello Mr. Mayor," he said to the only cabinet secretary to serve through both Reagan terms. Several years after Reagan left office, I asked a former White House staffer who frequently saw the president if he (Reagan) always recognized him. The man said, "He knew my face and he knew my name but not always at the same time." Physicians diagnosed Reagan with Alzheimer's approximately five years after he left office but the date of the onset will likely be pondered by political historians and medical experts for years to come. Peter Maer is a CBS News White House correspondent. You can read more of his posts in Hotsheet here. You can also follow him on Twitter.